I showed everybody one of my new tricks. The only problem with doing this trick is all the fluff rushes to my brain if I do it too long. In addition to having visitors, Sunday was Mother's Day. 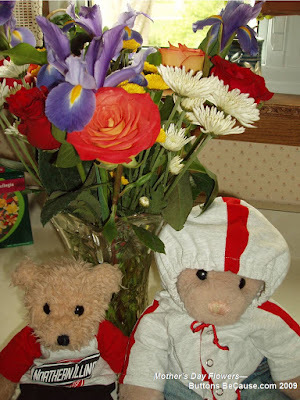 Dad helped us bears shop for some beautiful flowers for mom. Mom was exhausted by the end of the day. She served seven people for lunch and dinner for eight. Great Aunt K's train got in from Portland in time for dinner. After a day of visiting, playing peek-a-bear and dodging drool with my people cousin's baby. By the way I wasn't too successful in avoiding the drool, yuk! But he is so cute, despite the drool! As you can see, he got me. I was exhausted too. A day of visiting, playing peek-a-bear and dodging drool with my people cousin's baby. I wasn't too successful at avoiding the drool, yuk! But he is so cute, despite the drool! I was exhausted too. Bunkey is spending a week or so at my house while my grandparents and great aunt go to Oklahoma to visit with more family. Scruffy is visiting until Saturday. Then he is moving to Chicago with Brother T. Don't know how often we'll see him then. 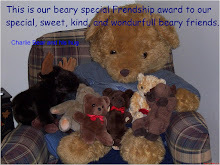 We've been keeping things low key and on our best bear-havior the last couple of days. Just a lot of visiting, sharing some honey, telling bear jokes and playing cards. Bunkey wanted to play poker, but we don't have any poker chips. What has my NH grandma taught this bear. We not only had all this company over the weekend, but my Illinois grandpaw was back in the hospital. Since mom didn't get in to see him, she has been driving grandma in to the VA Hospital. He came home today. Well I've got to run, the guys want to play cards again. You have a beary full house. Thanks for sharing all your adventures and pictures. I especially like the one of the baby boy Ethan. He's my Mom's favorite too. 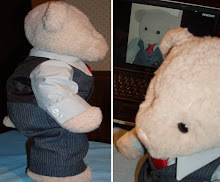 But, the bear pictures are cute too...like the one of Bunky in the mask. Anyway, thanks for sharing! Hope your Grandpaw is feeling better soon!